You’ve done it, darlings! While many girls (regardless of their magnitude of glamour and fabulosity) are still scouring the world, searching high and low for a significant other who complements their personality the way a pair of strappy sandals complement a luscious Little Black Dress, you have accomplished such a feat. You have reached the unreachable dream and bagged a boy who has proven himself to be the Dolce to your Gabbana; and while you’re not quite ready to say I Do, or find him down on bended knee with a Tiffany box in hand, there is one thing that you most certainly wouldn’t mind receiving from your cute boy du jour to show his commitment and devotion to you…a promise ring. Petite in size yet full of the type of meaning capable of making one misty-eyed, a promise ring is said to be a symbol of a promise made between two people, oftentimes referred to as a pre-engagement ring, expressing one’s commitment to a relationship, and making a promise to another for a future together. But I digress. Now that you know what a promise ring is, let’s move on to the fun part, shall we? Discovering the Nice Promise Rings from MyJewelryBox! From Emerald to Amethyst, Blue Sapphire to Pink, MyJewelryBox features le perfect plethora of pretty, pretty promise rings to satisfy the taste of any glamourai – be she of the chic city slicker or tantalizing tomboy variety. The question is…how does one settle on a singular style? Tell me, lovers; which promise ring has caught your eye? 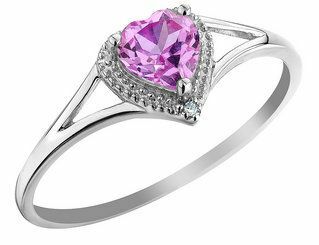 Do you covet the Pink Sapphire Heart Ring with Diamonds? Are you swooning over the Ruby Heart Ring with Diamonds? Does the Sapphire Heart Ring with Diamonds top your wish list? Dish dolls! Thanks to MyJewelryBox for the pictures. are you getting engaged or something? just a hunch! have a fab weekend girl! Love the blue one -- really pretty. Promise Rings are such a great idea. I still need to find a cute boy, but when I do, I'm totally going to make him buy a Promise Ring for me, hehe. I so love the blue sapphire. But I love pink, too. Amethyst! if only ..all are great finds! the blue sapphire ring looks gorgeous, but i'd skip the diamonds, they're so politically incorrect..
Hmm, I don't know whether or not I like the idea of a promise ring. I don't wear much jewelry, anyway. They're both so pretty. The blue one is really pretty, but I think I like the pink sapphire better for a promise ring. It's more subtle. 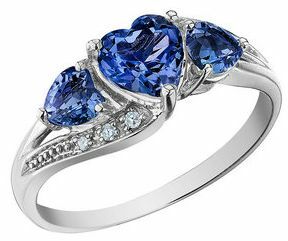 Completely and undoubtedly the sapphire heart ring. I love the color and the diamonds. J'adore! The Blue Sapphire ring is SPECTACULAR, I would prefer that one.